The Divine Favor series provides a compact insight into the divine classes. It gives additional options, expands domains and provides feats for them. I'm starting with Paladin first as this has bearing on a game setting I'm working up. Serendipity is cool like that. Metric: Grails. Spurs were already taken... and the paladin has archetypes like Sir Lancelot and Sir Percival. DISCLAIMER: Review based on a PDF review copy provided by Open Design. Divine Favor The Paladin engages player interest, providing a how-to for new players. Options for experienced players and GMs wanting to create paladin orders with a difference are provided. Crunch is balanced complimenting Pathfinder core. Stefan Styrsky's writing encourages play, which is the point. The Paladin starts out with an introduction to the class and it's features. This is Paladin 101 study notes - detect evil before smiting, using spells to buff rather than heal. Useful for those unfamiliar with the paladin class or in a hurry to play a paladin well. Alternate Class Abilities shows a greater willingness to hack the class. The Divine Aspect provides a potent yet balanced alternate build for would-be avatars of a god. The stigmata rules provide options for punishing errant paladins without simple removal of spells or imposed quest. Archetypes offer roleplaying hooks and crunch - the heavenly beacon and metropolitan offer some different takes while the templar, questing knight and holy sword are orthodox paladins. I'm impressed by the templar and metropolitan archetypes. These go beyond the typical 'smiting knight' image. Heavenly beacon is a paladin with bardic inspiration instead of smite evil and aura of justice. I could easily see an NPC lieutenant with this archetype. Codes of Conduct explain how a paladin behaves. The option to take vows that enforce these behaviours to extremes is offered with a little crunch to sweeten the deal. An attractive option if your roleplaying is good - your party may praise and curse you equally. Feats round off the additonal options. Many tap into codes of conduct or alternate class abilities though a couple are open to divine spellcasters. Personal favourites include purity of body (a vow of abstinence to protect you from poisons, drugs and alcohol) and paragon of virtue. 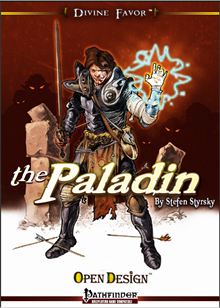 The cover by Christophe Swal shows the paladin surrounded by monstrous foes. Lighting gives the paladin's face an otherworldly appearance. The layout and typeface is clear and consistent. Inside, a mixture of woodcuts and colour panels provides appearance distinctive to Open Design. The PDF is indexed sensibly and links are addressed correctly. In conclusion, those looking at Divine Favor will notice parallels with Open Design's Advanced Feats series. Introduction to a class, expanding player and GM options and making it all very playable. The additional options are balanced and inspiring. At this price, this is inspiring value.